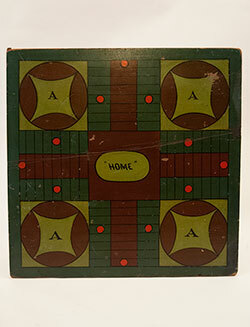 Antique American Gameboards For Sale: Original Paint Decoration, Checkers, Parcheesi, Backgammon, Double Sided, Early 20th and 19th Century Game Boards. 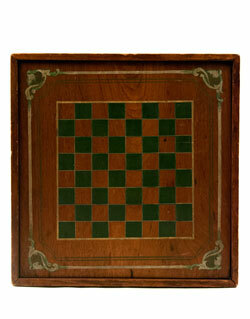 Original Paint Decoration, Checkers, Parcheesi, Backgammon, Double Sided, Early 20th and 19th Century Game Boards. 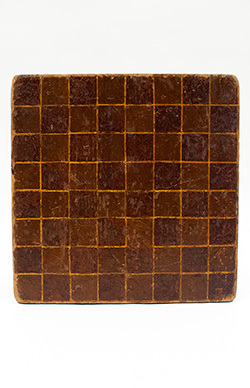 Circa 1870s: Both sides of this striking 15 3/4" square nine-color antique game board are incredibly graphic with super visual pop, high contrast, and the best original painted surface. 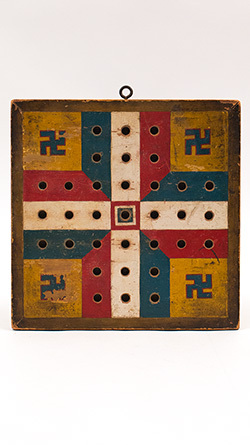 The wonderful star corner blocks on the Parcheesi board attract the eye, point the viewer to the game's central home square, and symbolize America's centennial anniversary and the coming together of a healing nation in the decade after the Civil War. The reverse is equally pleasing with its checkerboard and its spectacular dry and undisturbed first surface. 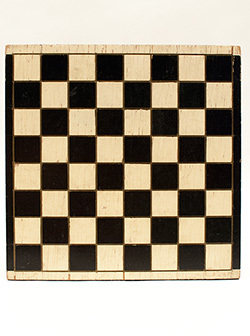 Circa 1920-1940: This snazzy 14 1/4" square checkerboard in classic original black and white painted squares with original gold radiator paint borders reminds one of the classic black and white tiled dance floors of the 1920s and 30s art deco jazz age. 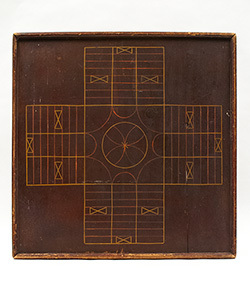 This is a very affordable antique American gameboard for the folk art and country primitives collector on a budget, the collector who prefers untouched original surface and simplicity of form. Circa 1900: In the days before radio took over as America's foremost evening pasttime, board games in front of the fireplace were our most popular form of family entertainment. People would spend many hours constructing one of a kind handmade gameboards for home use, and these endless variations prove a visual delight to the 21st century folk art collector. 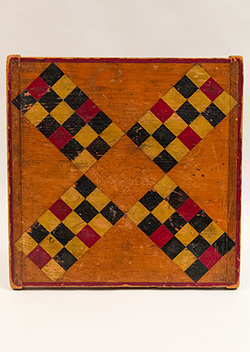 Circa 1880s: Measuring 15 3/4" x 15 1/4", this outstanding hand painted double sided four color backgammon and checkers board features square nail construction and mitred frame. 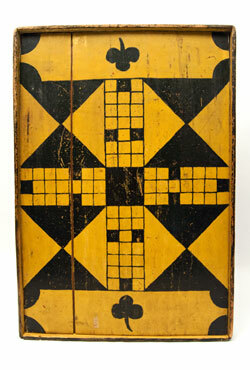 Both sides of this whimsical folk art gameboard boast an untouched, original surface with high quality craftsmanship. This board shows expected and age appropriate shrinkage to the wood and has the desirable crackled surface appropriate for its age. 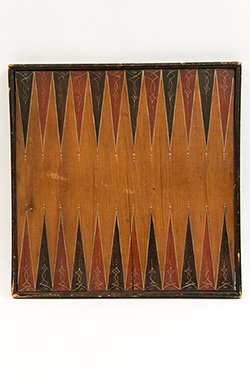 The backgammon board features hand painted lanes in an alternating color scheme with exhuberant flourishes and the dark lanes having hand painted decoration that mimics graining. 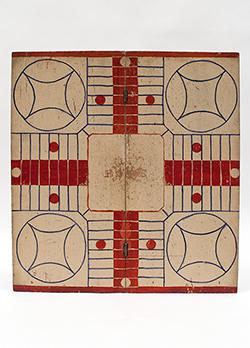 Great Original Surface: Fresh from a local Vermont estate is this wonderful antique American gameboard in original red and white paint. 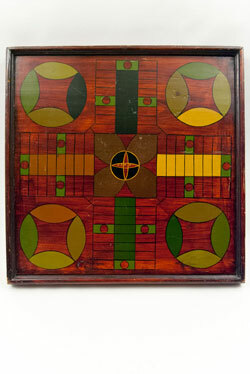 Nice primitive parcheesi on the other side. 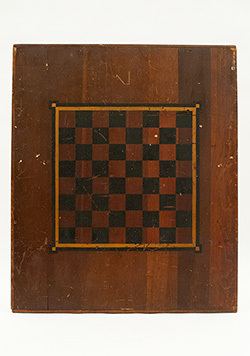 Circa 1880: Here is a wonderful four-color checkerboard in an unusual and pleasing color scheme: brown, hunter green, mustard, and black. 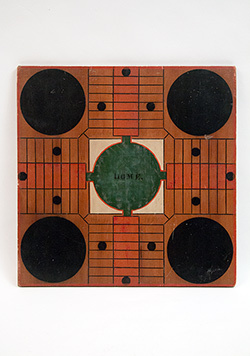 This Connecticut gameboard was obviously made by a professional, perhaps a carriage painter as evidenced by the thin green border and well-painted squares, and is in untouched original condition with the good, honest wear advanced collectors like to see. 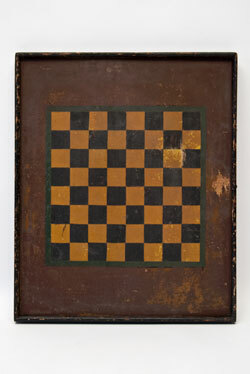 This lovely antique checkerboard is an excellent example of 19th century American folk art and will compliment any collection of early game boards, antique country primitves, or high quality americana. 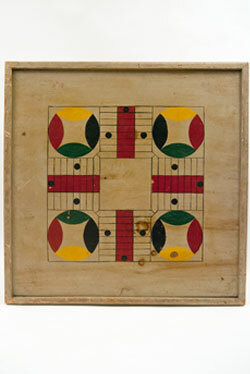 Circa 1920s-1930s: Small traveling gameboards in original paint are rare and desirable, and this five-color Native American made 9 1/4" square gameboard with Indian Friendship signs (also called Rolling Logs) with patriotic red, white, and blue paint is rare indeed. 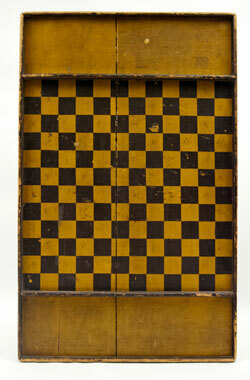 Great Original Surface: Fresh from a local Vermont estate is this wonderful antique American gameboard in original yellow and black paint. 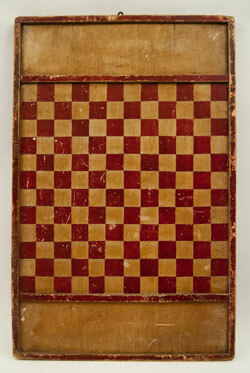 Circa 1910-1930: Measuring 20" square, this visually stunning double sided Parcheesi and Checkers game board is painted on a single piece of early 20th century plywood. 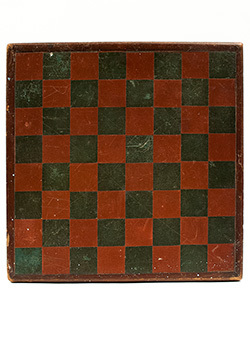 The checkerboard has an unusual tiger maple grain painted ground that, in conjunction with the red border and black squares, make it extremely vibrant and eye catching.The Parcheesi side is overly stunning with a rich windsor green ground, deep indian red, bright red dots, an apple green and trimmed in black outlines. Both sides exhibit fabulous patina and aged surface. 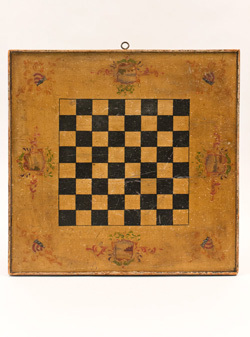 This beautiful 19th century American double sided checkers and backgammon paint decorated game board was obviously made by a trained carriage painter because of its excellently done pin striping and superbly done flourishes on each of the checkerboard's corners. 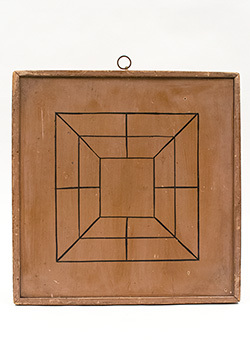 The original square nail construction evident on the piece's frame plants this antique game board's date of creation solidly into the 1880s. 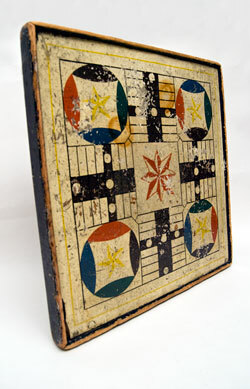 The surface of this handsome folk art game board has excellent patina, and the paint decoration has perfect crazing consistent with a board of 19th century vintage. 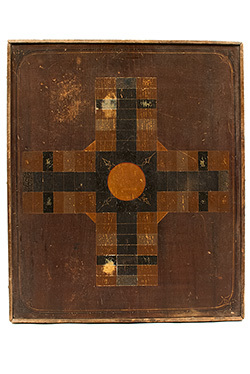 Both sides of this fine piece of antique Americana are equally graphic, and the condition of this early checkers and backgammon board is off the chart. 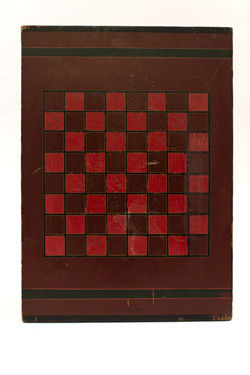 Circa 1900: This large 27" x 19" New England gambler's game board features a checkerboard with hearts, clubs, diamonds, and spades on one side and a Parcheesi board with unusual mustard and black hourglass squares and a single club at either end of the board. 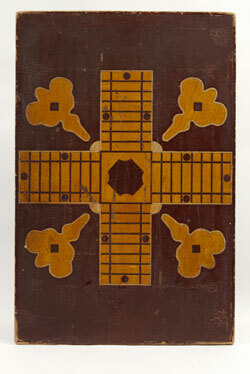 Both sides are equaling pleasing, making this board a fabulous example of early American painted folk art that is certain to make a bold statement in any advanced collection of antique Americana. Provenance: Ex. Tim Chambers. 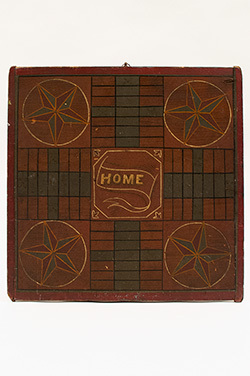 Circa 1880s, New England Origin: Measuring a little under 19 inches square, his handsome double-sided New England game board has all the bells and whistles that collectors desire: untouched original surface, superb graphic appeal, multiple borders, and good old honest wear in all the right places.